Daddy's Blind Ambition: And That's How You Do It! On Saturday, March 26, Matt competed in two events at the Gallaudet University Invitational, the 1500 and the 5000. Field events started in the morning, but track events started at noon. We arrived shortly after thinking we had some time since the first event was scheduled to be the 10,000; however, there must not have been any runners because it was no longer on the schedule. That meant Matt had about five minutes to change and warm up before the 1500. Our friend Matt and his son Sean arrived just in time to see the race and help cheer. There were five runners in the 1500, including Matt. One of the other runners, Alex, remembered Matt from the StarKids 5K. Matt and Alex (briefly) warmed up. There was only one heat. Matt didn't want to go all out for the 1500 since he still had the 5000 to race. He was worried he'd have lactic acid buildup in his legs. According to Matt, he ran at about 80 percent effort and finished in 4:36 (a second slower than his time at Nationals last year). He only needed to complete the 1500 in 5:00 to be able to compete at Nationals so he was pleased with his time. The winner completed the event in 4:27. Matt had some recovery time after the 1500 so that he could properly cool down and sit a bit before the 5000. Due to the number of runners, they decided to combine the men and women (there were only two men including Matt and one woman). It all happened so quickly so I didn't get my stopwatch started at gun, but was able to start it when he crossed the finish line after the first half lap. I yelled splits and Matt took photos every lap. Gallaudet was very accommodating to us. Everyone remembered Matt and they even made sure to call out the laps since Matt could not read the lap sign. We had one exciting moment about halfway through the race. Sean was playing with a ball and somehow it managed to roll under the fence and on to the track. I don't think it could have happened twice. Luckily, one of the timekeepers saw the ball and was able to pick it up before the runners reached us. Mishap averted. He completed the 5000 in 16:59 -- a new personal record (by 3 seconds). The other male runner in the 5000, a freshman from Gallaudet, kept up with Matt for the first five laps, but then couldn't hold. He completed the event in 17:07. Matt went into the track meet with the goal of qualifying for Nationals and he did that. Next up is the Desert Challenge Games in Arizona. Thankfully the two events will be on different days with the 5000 being first so that he can race all out and get his times down. We're getting a lot closer to our destination! This past Friday, Matt picked up my bib for me at the Cherry Blossom 10-miler expo. 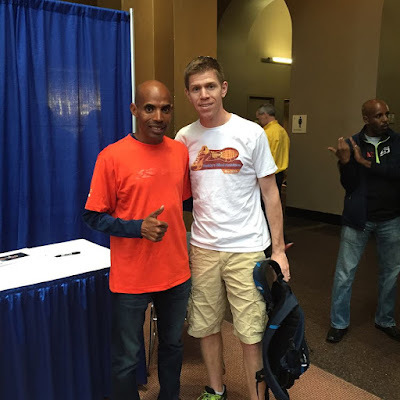 While there, he got a photo with Olympian Meb Keflezighi. I knew he was going to be there so I sent Matt with a photo album from the 2010 Boston Marathon that had pictures of Meb and Matt on the winners podium after the race. He signed it -- so cool. Maybe both will be on Team USA in Rio? I hope so!